In a previous post I introduced one alternative for performing integrated BOF development within Composer. 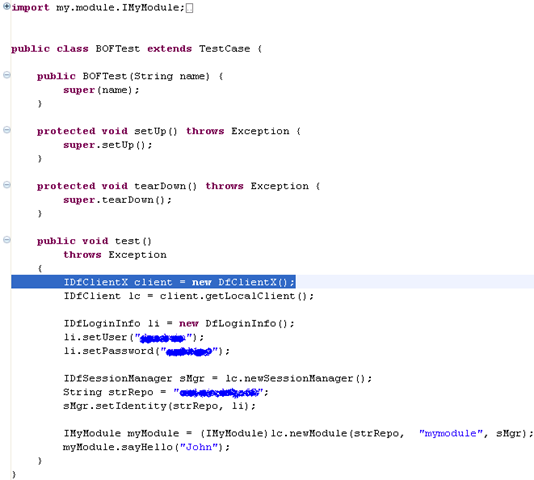 For the uninitiated, in BOF2 class loading is performed by DFC using a special class loader. This allows module (type, aspect, service, …) implementations to be stored in the Repository and served up to clients upon-demand. This allows you to leverage the power of the Content Server (version control, etc) on your Java modules. Overall this is a nice feature and it ensures you get the right behaviour for the aspects, types and services that your application uses. However, it does complicate the development lifecycle as you have to package and deploy your modules to a development repository before you can test them. For IDE debugging this can be a nuisance. To assist during development there is a feature built in to DFC that allows you to skip the Repository class loading step for specific modules. Let’s take a closer look. As per my previous article create a project and within it your module. Now create another Documentum project to host your module’s test code. 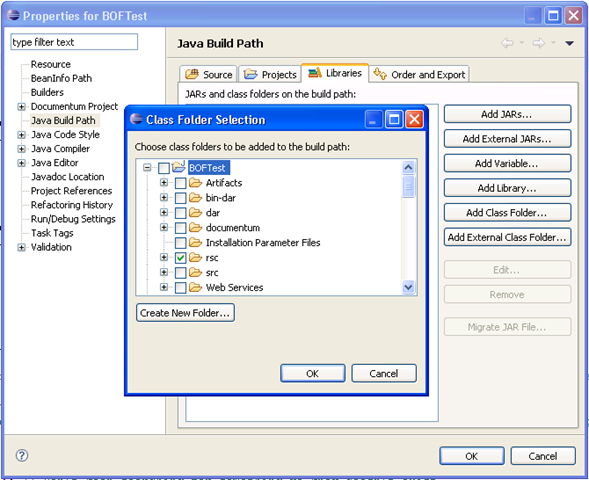 The reason we create a Documentum project as opposed to, let’s say, a regular Java project is that a Documentum project will be set up with a DFS library already on its classpath. This library contains DFC and as result is a very convenient leg-up as we are just about to create some DFC-based test code. “module” specifies the module’s type. Other values could be “aspect”,”type” or “service”. And “my.module.MyModule” is the fully qualified class name to your module’s implementation class. The same class name is specified in the class name field of your Module Artifact. This file is a local module registry. You can add additional lines to suit for each module that you wish to debug in your IDE. Click Apply to save the launch configuration. 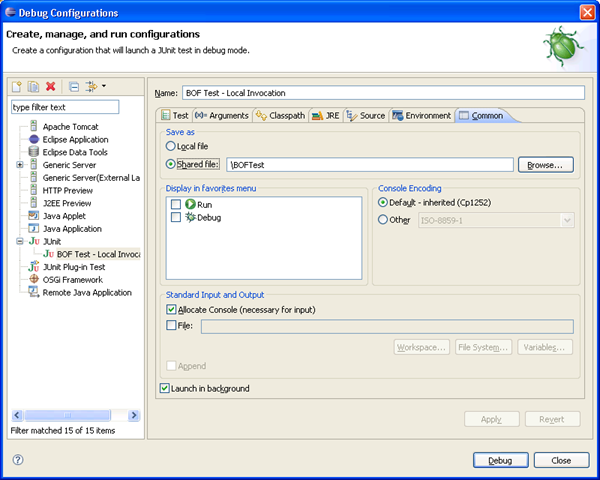 I would also recommend that you create a second launch configuration, call it something like “BOF Test – Remote Invocation” and on this configuration remove the system property. Make sure you save it to the same location as the local invocation configuration. This will allow you to test in local mode or remote mode. There is good reason for doing this as I will explain shortly. Finally, as a one-time only operation we need to install the module so that it is registered properly with the Repository. Right-click on your module project and select Install Documentum Project. That’s it. You are now all set. To test your module. Right-click your test project and choose Debug As… (or Run As…)->Debug Configurations… Make sure the local invocation launch configuration that you created earlier is selected and hit Debug. Or simply use the toolbar short cuts buttons. Once its run. Make a change to your module’s implementation. Be sure not to install the project again and re-invoke the launch configuration. 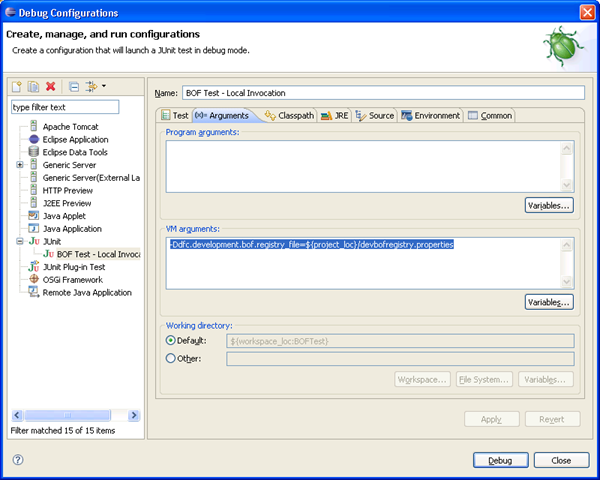 By setting breakpoints in your module implementation you will be able to see you modified implementation being executed. This article demonstrates how to streamline the BOF development process. It also demonstrates how to create launch configurations and how to share them with your team by saving their definitions in the workspace and using source control. One very important note. Be aware that this local invocation is really a bit of a cheat and that its usage can mask packaging problems. The fact that the class is visible in your project does not necessarily mean it will be visible with proper BOF class loading. To a large extent DFC and Composer try to negate this through the insistence of the one-time only install and through the build process respectively which catches errors. And also why I recommended creating a remote invocation launch configuration as well as a local one. But this might not stop packaging problems creeping if, let’s say, you subsequently modify your module’s packaging structure. The long and short of it is that whilst the workflow outlined here can be a real productivity boon for your developers your Documentum applications should also always go through a proper QA cycle.